How would you rate your overall experience of this festival? Toronto rock band Triumph on August 26th, 1978 in front of 110,000 people at Mosport Park near Bowmanville, Ontario, for Canada Jam (a full-day festival which featured the most bizarre concert line-up of all time, including the Commodores, Doobie Brothers, Village People, Kansas, Johnny Winter and more). This is a very rare early video of Triumph (shot two months after their "Live at the Forum" show at Ontario Place Forum). Unfortunately this broadcast showed only one song, Rocky Mountain Way, plus the drum solo. The rest of the concert has never been seen and probably does not exist (though a great audio soundboard bootleg of the show has survived). This is Triumph as they were ascending into stardom. Rik Emmett, Gil Moore and Mike Levine. They closed the show, their last song finishing at 3:35 a.m.! Most of the crowd remained right to the end. Rare live video of the original 6 Kansas members during their prime years playing their hit single Point Of Know Return. It's not up to par with the Dust In The Wind footage, but it's the best that is available and I did some remastering to make it more enjoyable. 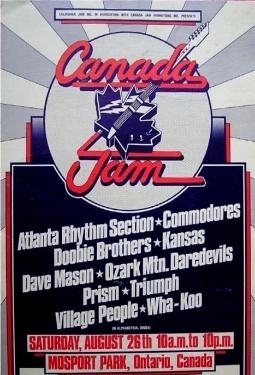 I think many will agree it's about time the entire Canada Jam set gets a proper release on DVD. In the meantime: enjoy this one! The band: Kerry Livgren Steve Walsh Robby Steinhardt Dave Hope Rich Williams Phil Ehart This was recorded on 1978-08-26. Live in Ontario on August 26th, 1978 at Canada Jam. Enjoy!! "This land is your land and this land is my land, sure, but the world is run by those that never listen to music anyway."